There are always new and exciting projects taking shape and being completed at Joybeck Custom Builders. 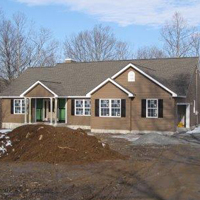 Contact us for a tour of our Lake Wallenpaupack Custom Homes or Milford, PA Custom Homes. This modern design with high performance energy specifications is 2,500 square feet and being built on McConnell pond in Hemlock Farms. 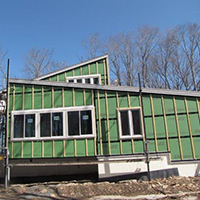 Some features integrated into this high efficiency building system include ICF foundation walls, advance framing and air sealing techniques, high efficiency heat pump system, ERV system and triple pane windows. This 1,850 square foot ranch home offers a Master suite, 2 additional bedrooms and 2 full bathrooms, large eat in kitchen and formal dining room. With a 2 car garage and deck or optional screen porch this home design offers our clients a great value for their dollar. 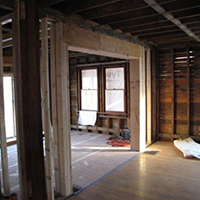 Complete interior and exterior renovation and remodeling of home in Milford that was built in the mid 1920’s. Project scope also includes an addition creating a large kitchen on the first floor and master suite on the second floor. This Wallenpaupack Lakefront craftsman style home features 8,000 square feet of living space with 5 bedrooms and 7.5 bathrooms. Exterior features include custom timber frame details, Marvin Windows and Doors, Roofing by Davinci Roofscapes and large masonry columns. Interior features include custom tile showers, reclaimed flooring, home automation, custom cabinetry and much more. © 2019 All Rights Reserved, Joybeck Builders Inc.